The Use of Geographic Information System as a Tool for Schistosomiasis Surveillance in the Province of Davao del Norte, the Philippines. Geospatial Health, 12 (2): 199-209, 2017. Map of Davao del Norte overlaid with the SCH determinants and variables. Schistosomiasis (SCH) in The Philippines is caused by Schistosoma japonicumand remains endemic in 28 provinces in 12 regions. Effective SCH control requires describing areas at risk where control efforts may be focused. This study aims at demonstrating the utility of geographical information system (GIS) as a tool for SCH surveillance in the province of Davao del Norte. 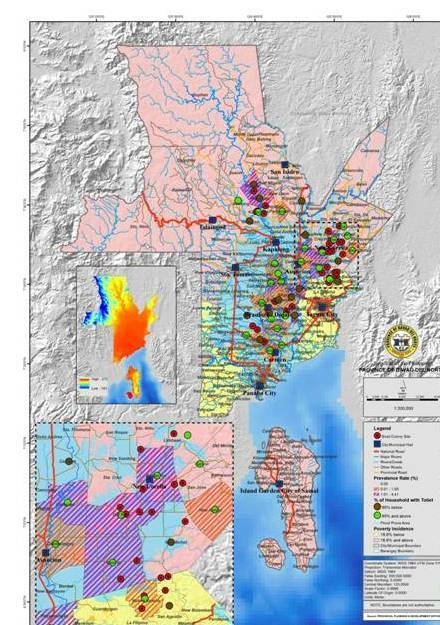 Qualitative and quantitative data on SCH determinants, obtained from local government offices, partner agencies and institutions, were standardised, formatted and incorporated into a GIS map. Atrisk areas are described in terms of determinants and (variables), which included geography and climate (topography, temperature and flood-prone areas), agriculture (irrigation and land use), poverty (percentage of households with income below the poverty threshold), sanitation level (percentage of households with sanitary toilets), intermediate and reservoir hosts (presence of snail colonies and reservoir hosts) as well as prevalence and treatment coverage. Endemic villages (barangays) were generally found to be located in flood-prone areas in the lowlands near major rivers. New Corella has the highest poverty index among the SCH-endemic areas studied as well as the highest number of confirmed snail colonies. Among known endemic localities in Davao del Norte, Tagum City was found to be the only city meeting the poverty index target of <16.6%. Clustering of SCH cases were reported in six barangays ranging from 0.48% (8 out of 1,655) in Braulio Dujali to 2% (25 out of 1,405) in Asuncion. This study demonstrates the utility of GIS in predicting and assessing SCH risk, which allows prioritisation and allocation of control resources and delivery of services in areas at the highest risk for SCH. “Basta Masaya, Ok Na: Theater-Based Approaches in the Philippines” in The Routledge Handbook of Community Development: Perspectives from Around the Globe. Sue Kenny, Brian McGrath and Rhonda Philips (editors). New York, USA: Routledge, 2018. A Review of the Results of the Very Long Chain Fatty Acid Analyses for X-linked Adrenoleukodystrophy at the Biochemical Genetics Laboratory of the Institute of Human Genetics-National Institutes of Health, Manila. Acta Medica Philippina, 51 (3): 223-227, 2017. X-linked adrenoleukodystrophy (X-ALD) is a progressive genetic disorder affecting the metabolism of very long chain fatty acids in the adrenal glands, spinal cord and white matter of the nervous system. It is an inherited metabolic storage disease whereby a defect in a specific enzyme results in the accumulation of very long-chain fatty acids (VLCFA) that are harmful to some cells and organs. VLCFA analysis for confirmation of X-linked adrenoleukodystrophy is one of the most requested tests among the send-out laboratory services of the Biochemical Genetics Laboratory at the Institute of Human Genetics. This paper aims to review the clinical characteristics and the results of the VLCFA analysis of the patients whose samples we received for testing from years 2002-2016. The results showed that out of the 54 samples submitted to our laboratory, 19 (35%) of the samples received from male patients suspected to have X-ALD yielded positive results and another 10 (19%) females were found to be carriers. Visual defect followed by deteriorating mental status were the most frequent indications for VLCFA testing. Having a significant diagnostic yield of 54%, early diagnosis of X-linked adrenoleukodystrophy in our population is important so that proper management that could prevent the progression of the disease could be timely instituted. A Techno-Economic Assessment of Wave Energy Resources in the Philippines. Renewable and Sustainable Energy Reviews, 88: 68-81, May 2018. The study focused on developing a map of sites all over the Philippines that are technically and economically feasible for harnessing wave energy. The study included three wave devices with advanced technology readiness levels that could be used in the potential sites, and the projected levelized cost of electricity considering different scenarios of financing. Data of wave height and wave period were collected for 1 full hear at 3 hour intervals daily. Results show that there is around 10 – 20 kW per meter of wave energy in various areas around the country, mostly in the Pacific side with some sites in the north of the country. The cost of electricity computed is comparable to current technologies. Isometries and Binary Images of Linear Block Codes Over Z4 + uZ4 and Z8 + uZ8. Journal of Physics: Conference Series, 893: (1): 012049, 6 pages, 28 October 2017. Information theory, as a branch of mathematics, is anchored on the principle that all communication is essentially digital. As coded information transmitted across noisy communication channels will most probably be corrupted, a branch of information theory called coding theory is applied in communications to enable the detection and correction of errors in the coded data, thus recovering the original information that was sent. This research utilizes the tools of algebra to construct channel codes from source codes as modules over a certain class of algebraic structures from the modulo class rings of integers on which suitable weight functions are defined. Certain compositions of isometric mappings that preserve the weights are then applied on the channel codes to generate binary codes of predicted length which may or may not be linear. Certain lower and upper bounds on the minimum distances of the binary codes are also derived in terms of the parameters of the ring codes. Several new codes and their binary images are constructed. Finally it turns out that the method introduced in this paper can be generalized further to higher classes of rings. Orbit Codes Over M 2(F q ) and Their Homogeneous Distance. Journal of Physics: Conference Series, 960: (1): 012004, 6 pages, 2018. Information theory, as a branch of mathematics, is anchored on the principle that all communication is essentially digital. As coded information transmitted across noisy communication channels will most probably be corrupted, a branch of information theory called coding theory is applied in communications to enable the detection and correction of errors in the coded data, thus recovering the original information that was sent. This research utilizes the tools of algebra to construct orbit codes over a certain class of algebraic structures, the rings of two by two matrices over a finite field, on which suitable weight functions are defined. It turns out that the orbit codes constructed achieved distances which are practically optimal with respect to certain known upper bounds. Polarizing Figures: Executive Power and Institutional Conflict in Asian Democracies. American Behavioral Scientist, 62 (1): 92-106, 2018. This article is part of a Special Issue on Polarization and Democracy. It analyzes the causal factors behind the different regime outcomes of polarized crises brought about by conflicts between incumbent governments and their elite opponents. Using a comparative perspective, it argued that the strategies employed by elites mattered to a great deal on whether polarized crises can result in regime instability and breakdown. Cases from Indonesia, the Philippines, South Korea, Taiwan, and Thailand were used to highlight how elites attempted to hold elected heads of governments accountable. Taiwan and Korean elites were patient to use existing democratic institutions in resolving political crises. On the other hand, Southeast Asian elites relied on extra-constitutional means such as military coups and people power to depose democratically-elected governments. This research increases our understanding on why not all polarized crises lead to democracy’s doom and can alert political elites to exercise constraints, sobriety, and patience in limiting and challenging executive power. Improving the Surface Properties of Municipal Solid Waste-Derived Pyrolysis Biochar by Chemical and Thermal Activation: Optimization of Process Parameters and Environmental Application. Waste Management, 72: 255-264, February 2018. Plot showing the development of micropores and increased number of mesopores after the activation of the biochar sample. Scanning electron micrographs of the pristine and activated biochar samples before and after adsorption of methylene blue. Biochar produced from the slow pyrolysis of municipal solid waste was activated with KOH and thermal treatments to enhance its surface and adsorptive properties. The effects of KOH concentration, activation temperature and time on the specific surface area (SSA) of the activated biochar were evaluated and optimized using central composite design (CCD) of the response surface methodology (RSM). Results showed that the activation of biochar enhanced its SSA from 402.8±12.5 to 662.4±28.6 m2 g–1. 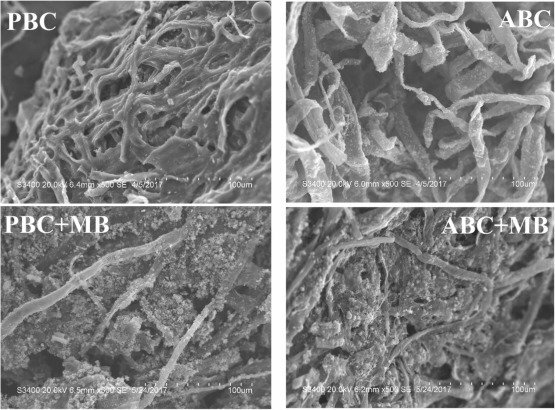 The adsorptive capacities of the pristine biochar (PBC) and activated biochar (ABC) were compared using methylene blue (MB) dye as model compound. For MB concentrations up to 25 mg L-1, more than 99% dye removal was achieved with ABC, while only a maximum of 51% was obtained with PBC. 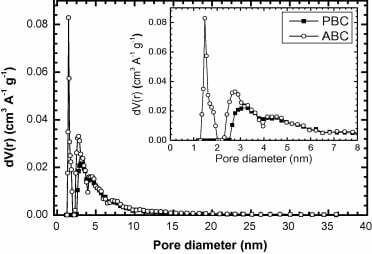 Results of the isotherm study showed that the Langmuir model best described MB adsorption on ABC with adsorption capacity of 37.0–41.2 mg g–1. The International Long-Term Ecological Research–East Asia–Pacific Regional Network (ILTER-EAP): History, Development, and Perspectives. Ecological Research, 33 (1): 19–34, January 2018. There are growing needs to broaden and deepen our multi-faceted understanding of the ecosystems, and the networks of Long-Term Ecological Research (LTER) can play significant roles in fostering and applying ecosystem studies at regional and global scales. The International LTER Network (ILTER) is organized as a global network of field research sites and scientists to address current ecological issues such as biodiversity loss and ecosystem degradation within a globally changing environment. The ILTER East Asia–Pacific Regional Network (ILTER-EAP) is one of the four constituent ILTER regional networks. Currently, ILTER-EAP comprises nine formal ILTER members and two associate networks. Their activities involve long-term and multiple-site observations of structural, functional and developmental aspects of ecosystems, data sharing, and bridging society and ecological science. This paper presents a review of the activities of ILTER-EAP, focusing on its: (1) vision and the development following its inception, (2) scientific activities and major outputs related to selected thematic areas, (3) contributions from ILTER-EAP to the inter- national initiatives, and (4) future challenges and opportunities relating to its development and role in facilitating regional and global research collaborations.